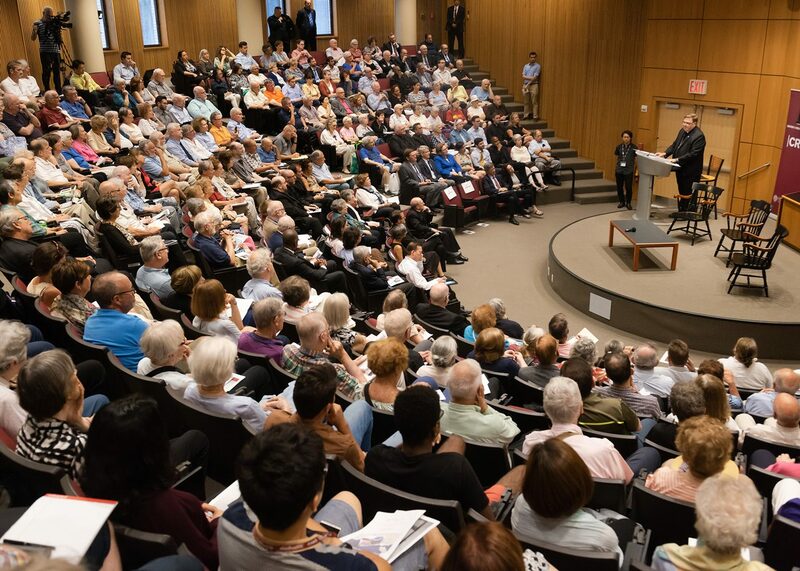 NEW YORK (CNS) — The role of faith in the free market is to insist that a just economy is built on a moral framework that serves the common good, according to speakers at a Sept. 5 event at Jesuit-run Fordham University. Cardinal Joseph W. Tobin of Newark and economist Jeffrey D. Sachs, professor of Sustainable Development at Columbia University, traced the history of the Catholic Church’s robust engagement with social issues and said Pope Francis is a prophetic voice for the marginalized in an age of global inequality. As a “son of the global south,” Pope Francis has extensive experience with the social dimension of economics and “has seen the game played for too long to sugarcoat it,” Cardinal Tobin said. The pope’s blunt, alarming statements are caricatured by some as clerical meddling in the scientific sphere, but he speaks from a conviction that the Christian faith has a dimension that includes witness in the public square and in the marketplace, the cardinal said. Catholic tradition reflects on the economy through the lens of faith because life in community is at the heart of society, and social virtues and attention to the common good are valued, Cardinal Tobin said. Pope Francis insists on radical social change to combat inequality, beginning at the periphery, the cardinal said. “The periphery is a place that’s hard to see … it’s the people we don’t see at all,” he said. “Seeing someone through the eyes of faith is to see who they are,” he added. 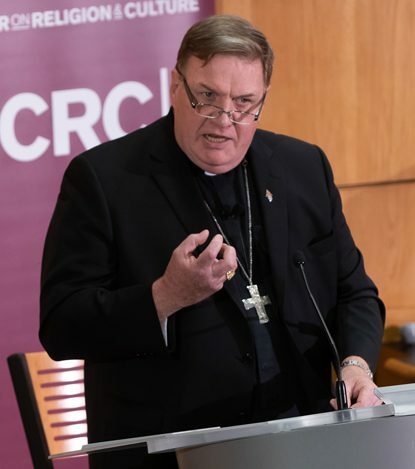 Cardinal Tobin said universities and business schools should teach ethics and help students understand finance and economy in a human dimension. Understanding church teaching is a first step to living in solidarity with others, he said. “No area falls outside truth and liberty,” including spending, investing and making higher level decisions that weigh profits against the human cost of generating them. Cardinal Tobin said the church does not have a preferred economic system, but its social teaching describes principles that should be included. Although it may seem Pollyannish, members of the church can help promote the common good by “making conscious choices to be at the margins, sit with people, listen and give them a face. If we can recognize our common humanity, that’s half the game,” Cardinal Tobin said. 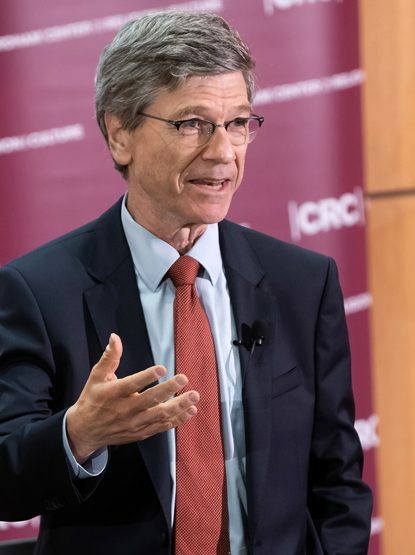 Sachs said church encyclicals have been a unique contribution to clarify economic and societal issues over many generations. “They tell us things we will not hear elsewhere in the public sphere, so we have to listen closely to understand the teachings,” he said. Greed is central to the American economic system, Sachs said, but the church has maintained its effort to promote a just economy. “The church has steadfastly and brilliantly kept the concept of the moral economy at the forefront, with Pope Francis its most important spokesman and visionary for the idea when we most needed it,” he said. He said the papal encyclical “Laudato Si, on Care for Our Common Home,” is an exhortation to get greed under control, because greed blinds people to what is right and enhances inequality. “In ‘Laudato Si,’ Pope Francis says our interdependence obliges us to seek a common plan for our common home,” he said. An unbridled market economy is both incredibly productive and incredibly destructive, Sachs said. Ideally, the country would have a “moral market” that respects human dignity, promotes the common good and protects the environment. The talk, “A Moral Economy: Faith and the Free Market in an Age of Inequality,” was sponsored by the Fordham Center on Religion and Culture. Washington Post reporter Christine Emba moderated the question and answer portion of the program. In his opening remarks, Cardinal Tobin acknowledged recent developments in the clergy sexual abuse scandal as “the bitter fruit of a toxic culture.” He said the painful issues have left Catholics aghast and evoked a global response, which he hoped would lead to healing and a restoration of trust. Greed is a spiritual problem. Secular economic changes do not cure it. Would have been nice to have seen William Easterly speaking in a catholic publication as he agrees with the Catholic Church’s teaching on subsidiarity . Jeffrey Sachs on the other hand disagrees and believe that an administrative state of a few should control the resources. Economics is typically not the strong point of most catholic theologians. Need to be careful who you pick.